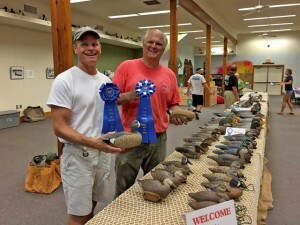 Tim (right) and Marc from Raleigh with the co-carved rig of blue wing teal that took first in marsh ducks and best in show. On the weekend of June 20, 2015 Tim Worth of Edgefield, SC, travelled to Harkers Island, North Carolina, to compete in the “rig of six” working decoy competition hosted by the Core Sound Waterfowl Museum. In this competition rigs of six working decoys are floated in the sound and judged from the bank. Tim entered a rig of blue wing teal that he co-carved with a friend from Raleigh, NC. 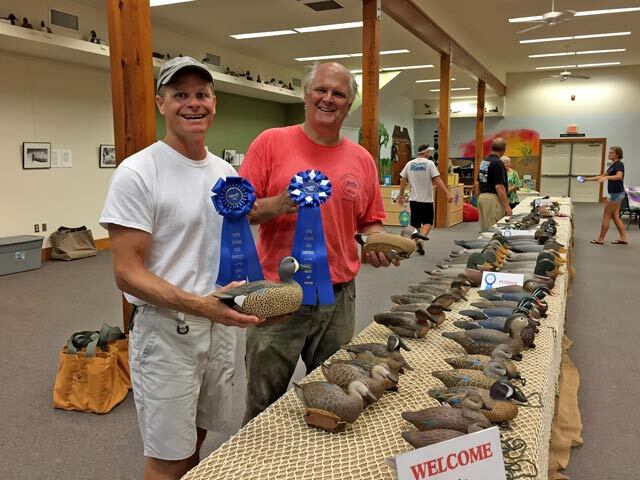 The blue wing teal took first in marsh ducks and best in show. A rig of green wing teal Tim carved took second in puddle ducks and third best in show. All of these teal will be on display in the museum through September. During the “rig of six” competition, Tim also competed in the first annual Kent Hood Superior Decoy Craftsman Competition where carvers brought a roughed out blank, a carving bench and hand tools and took the blank to a “naked decoy” ready to paint with no fillers or power tools. Tim carved a mallard that took third place in the competition.